Dinesh Panday received the 2018 MAIZE-Asia Youth Innovators Award from the CGIAR Research Program on Maize (MAIZE) for his work in soil fertility and nutrient management to determine the effectiveness of industrial by-product (i.e., char) in reducing environmental nitrogen loss and improve nitrogen fertilizer use efficiency in maize. A native of Nepal, he is a Doctorate Graduate Research Assistant in Soil Fertility and Nutrient Management at the University of Nebraska-Lincoln. In a recent interview, he discussed the challenges and opportunities facing maize in Asia, as well as the importance of involving youth in agriculture and maize-based systems. 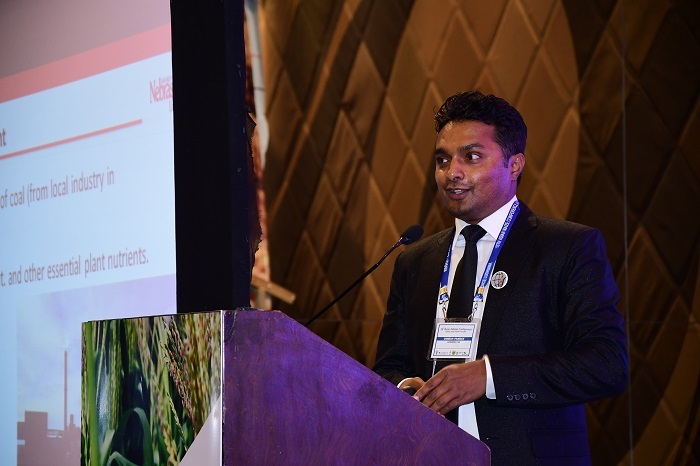 Dinesh Panday, one of the winners of the 2018 MAIZE-Asia Youth Innovators Award, speaks at the 13th Asian Maize Conference in Ludhiana, India. Photo: Manjit Singh/Punjab Agricultural University. My family has a long history in agriculture, which strongly rooted my passion in the field of soil science. As a researcher, I have been working in maize for few years now. Globally, maize is the second most cultivated crop after wheat, and is the staple food for 900 million people living on less than US$2 a day. Maize is used as food, feed, fuel, and fiber, and every part of the plant has economic value: the grain, leaves, stalk, tassel, and cob can all be used to produce a large variety of food and non-food products. In Asia, maize is popular with many smallholder farmers as it requires less water compared to rice and is relatively easy to grow and harvest. It fits into many cropping systems, including rice-wheat-maize, wheat-maize, rice-legume-maize, etc. Over 310 million metric tons of maize are produced on over 60 million hectares of land in Asia, and Nepal, my home country, produces 1.8 million metric ton of maize every year. However, there is a growing trend of higher demand compared to supply. The consumption rate of maize in Asian countries such as India, China, Thailand, and Vietnam are expected to grow at the rate of 4.5% annually up to 2021. Youth need to be included in efforts to increase maize production in Asia if we are to keep up with demand. More than 80% of maize growing areas in South and Southeast Asia are under rain-fed conditions, and are vulnerable to climatic extremes. The magnitude and dynamics of abiotic and biotic stresses are rapidly increasing due to changing climates, placing constraints on maize production. Recently, an invasive insect pest “fall armyworm” has been reported in India, which can cause high annual loss in maize production. Such changes in the agricultural landscape in Asia have put further pressure for efficient use of water, improved maize varieties, and to improve the quality of soil. Farmers in Nepal are interested in hybrid maize production, but due to lack of knowledge in proper nutrient management and low availability of quality seed, targeted yields are not achieved. In many Asian countries including Nepal, the commonly practiced soil fertility assessment is based on a random soil sampling protocol to obtain an average fertility value for a farmer’s field. It ignores spatial variability, or those soil-testing results do not provide the randomness of variations from one place to another. This means farmers cannot synchronize fertilizer rates with crop demand, and instead, use mostly acid-forming nitrogenous fertilizers. There is an utmost need to increase farmers’ awareness on the importance and safe use of balanced fertilizers to decrease environmental impact and increase maize yields. Response to these emerging and deep-rooted limitations in maize-based agri-food systems in Asia needs strong public and private sector partners to improve the livelihoods of smallholder maize farmers. Continued investment in research for development (R4D) is required to ensure higher maize production to meet its future demand. Tremendous opportunities exist for innovations in maize breeding, site-specificnutrient management, seed systems, and value chains, offering exciting prospects for future growth and development of maize. There is an increased engagement of women and young entrepreneurs in maize value chains as well. Over 80% of female employment in Nepal is in agriculture. Investing in women and youth, and empowering them through new technologies such as scale appropriate mechanization, information services, and market opportunities is essential to improve the quality of life in rural families, besides increasing maize production. 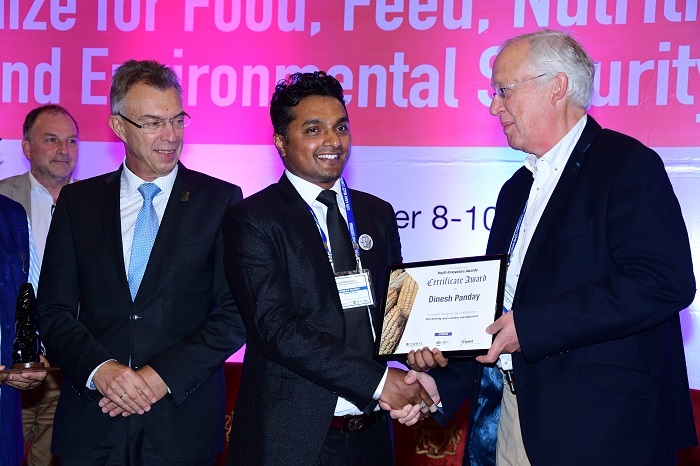 Dinesh Panday recieves the 2018 MAIZE Asia Youth Innovators Award at the 13th Asian maize Conference in Ludhiana, India. Photo: Manjit Singh/Punjab Agricultural University. Q: How can we better incorporate youth in maize R4D? Failure to recognize the role youth play in agricultural production means policies are not tailored to their specific contexts. Many agricultural research institutions lack youth inclusion in their strategic plan, or don’t know how they can make farming more attractive to youth. We need to realize the full potential of youth in maize value chains in Asia and contribute to their development because young people are a key part of the solution to increase long-term agricultural productivity. Youth must be included in the mainstreaming of maize R4D, and should be encouraged to work for positive impact in farming communities. A new generation of scientists and other professionals need to build knowledge sharing networks to strengthen collaboration, properly address constraints and to achieve a greater strategic impact on maize-based farming systems in Asia.